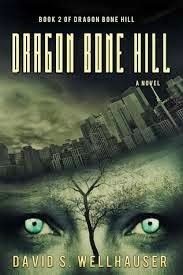 David S. Wellhauser's "Dragon Bone Hill" is the captivating second book of the Sci-fi Trilogy about the challenges of protagonist, Titus Pym, the ill, injured, and ousted leader of the Beluga Fay. Being pursued by many wishing to kill him, Titus Pym decides to enter a diseased, starved, and violence-ridden city for protection. However, soon after, Titus himself catches the Sweating Sickness and is near death. But thankfully, Dian and Putri Gomez, a daughter and mother living amongst the Remedios, save his life. This puts Titus and the women on equal terms as Titus previously saved them by donating the food storage room. After becoming well again, Titus becomes the leader of the Remedios, defends them from attacks, and must make tough decisions in order to survive in a very unsafe world. The book is very strong in terms of its fast-moving, action-oriented plot, as well as its character development that leads well into the finale of the series. In addition, Titus Pym is a likable and charismatic leader who understands the complexities of decision-making. This book is a must-read for anyone who loves the apocalyptic genre!